Doctor Who: Series 9 & The Return Of Davros? | Warped Factor - Words in the Key of Geek. Doctor Who: Series 9 & The Return Of Davros? For someone as long-lived as the Doctor, it can sometimes be difficult to pick out the epochal points of his time-line. But surely near the top of every such pub/Internet forum must be his trip to Skaro with Sarah, Jane, Harry & a Time Ring, and his subsequent failure to avert or delay the creation of the Daleks. Nine selves later it seems he's not a fan, his youthful flirtation with neck adornment long forgotten! "I need clothes, that's what I need. And a big, long scarf. No, no, move on from that. Looked stupid." 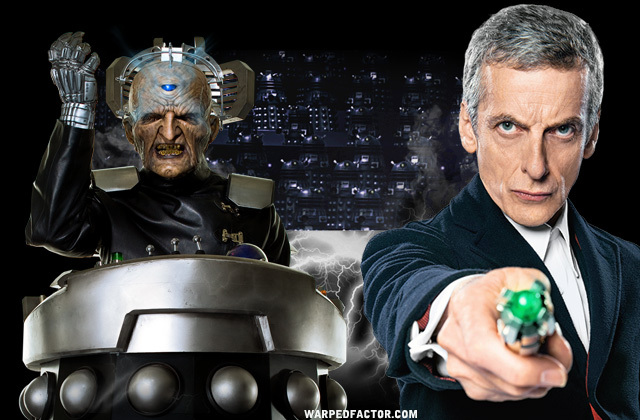 That's as may be, but his longest-serving and arguably best remembered incarnation seems to have laid the groundwork for a return to the scene of one of his biggest and potentially most damaging bouts of dithering, having been assigned by the Time Lords to go and take a look into what Davros had been getting up to. And it's here that the rumour mill enters overdrive. For there are those who claim that Davros is to return from the dead, or at least an implied demise going by the end result of The Stolen Earth/Journey's End. But its what he might do next, and the tantalising possibility of a meeting with a certain former chief scientist of the Kaleds, who might be a considerably younger man than when they first clashed both ethically & scientifically with which we can concern ourselves here. "Listen, if someone who knew the future pointed out a child to you and told you that that child would grow up totally evil, to be a ruthless dictator who would destroy millions of lives, could you then kill that child?" A hat-trick of such wobbles is surely but one possibility. Of course, deferring pulling the trigger might not be such a problem for an older and seemingly hardened Doctor, unless the Dalek despot appears as a younger man with his mind maybe showing only the slightest sign of an inclination towards universe-conquering evil. 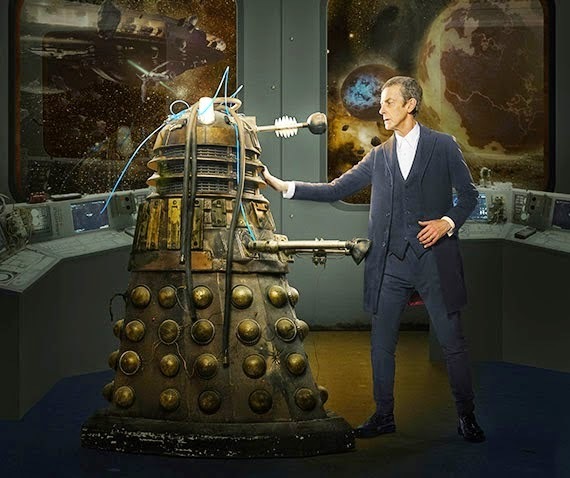 This situation might make this potential next meeting amid the chaos of war between the Kaleds & Thals the ideal chance to turn him away from a path which will eventually see him become Emperor of the Daleks, the closest he ever got to being "up above the gods." If he could be persuaded to bury all those megalomaniac tendencies he could in fact become a force for good, as he'd tried to convince his prisoner he was during one of their initial discussions during that first meeting. DAVROS: Then my Daleks do go on. They do survive. DOCTOR: Yes, as weapons of hate and machines of war. DOCTOR: But there's still time to change all that. Why not make them a force for good throughout the universe? DAVROS: I could do it. DOCTOR: Then do it. Be remembered for that. DAVROS: You have seen my Daleks in battle? DOCTOR: Many times. I've fought against them. DAVROS: And do they win? Do they always win? DOCTOR: Not always. They have been defeated, but never utterly defeated. The Dalek menace always remains. DAVROS: If, as you say, they become the supreme creatures of war, how can they lose? How can they fail? DOCTOR: Misfortune, lack of information, sometimes overwhelming opposition. DAVROS: Yes, but tell me, how do the Daleks fail? DOCTOR: No, Davros, that is a question that the future must keep secret. Imagine a similar experiment with their creator persuaded that qualities he could in future view as defects were actually strengths and we may bear witness to a radical rebirth for those magnificent mutants in their travel machines. "You are my enemy! And I am yours. You are everything I despise. The worst thing in all creation. I've defeated you time and time again. I've defeated you. I sent you back into the Void. I saved the whole of reality from you. I am the Doctor. And you are the Daleks." But what if the Doctor's prejudices towards them were to paint him as the villain of the piece should they see the light in any possible alternative past during which any goodness on their part isn't an elaborate ruse? Lest we forget his stooping perilously close to their level in Dalek. And if he can do that, surely the time has come to explore what would happen if his influence were to meaningfully rub off on them, finally answering his question to the one down in that vault in Utah. "If you can't kill, then what are you good for, Dalek? What's the point of you?" The time may have finally come for them to leave their shells both literally & figuratively, to tangibly feel. "I can feel so many ideas. So much darkness. This is not life. This is sickness." Shaking that disease might arguably mark a watershed for Doctor Who - as well as a fulfilment of Sec's vision for his species. "The species must evolve a life outside the shell. The children of Skaro must walk again." Doctor Who Series 9 begins September 19th 2015.